Can Hurricane Impact Windows Stop a Bullet? Hurricane impact windows can withstand a great deal of force. Their unique construction allows these window types to absorb direct hits from flying debris during storms with high winds and hurricanes. Due to being difficult to shatter, impact windows can also decrease the chances of home burglary. As a buyer, you may also desire protection from bullets, depending on the security needs in your general area. In fact, the demand for bullet-proof windows and doors have increased exponentially, and is expected to become a 2 billion industry by the end of 2026. With the increasing need for multi-faceted protection in our homes, here is a comparison between impact windows and common bulletproof glass. When comparing hurricane impact windows to bulletproof glass it’s important to understand how the two differ. Windows sold to homeowners that are labeled as hurricane-resistant or storm-proof are typically made with impact-resistant glass treated with a layer of ethylene-vinyl acetate (EVA) or polyvinyl butyral (PVB). PVB is what makes current car windows shatterproof. Combining PVB with a window-glaze layer made of polyvinyl terephthalate (PET) adds another layer of protection to an impact window. The inner layer of EVA or PVB can range in thicknesses; but the thicker the inner layer, the more expensive the window. The upshot to a thicker layer is that you’ll have much more protection and your window will be able to take more of an impact without breaking a sweat. The EVA and PVB inner layer on impact-resistant windows can vary from about .010 inches to .090 inches, which might not sound like much but is plenty protective considering the strength of this material. To learn more about impact window construction, check out Alco’s article on how they’re made. 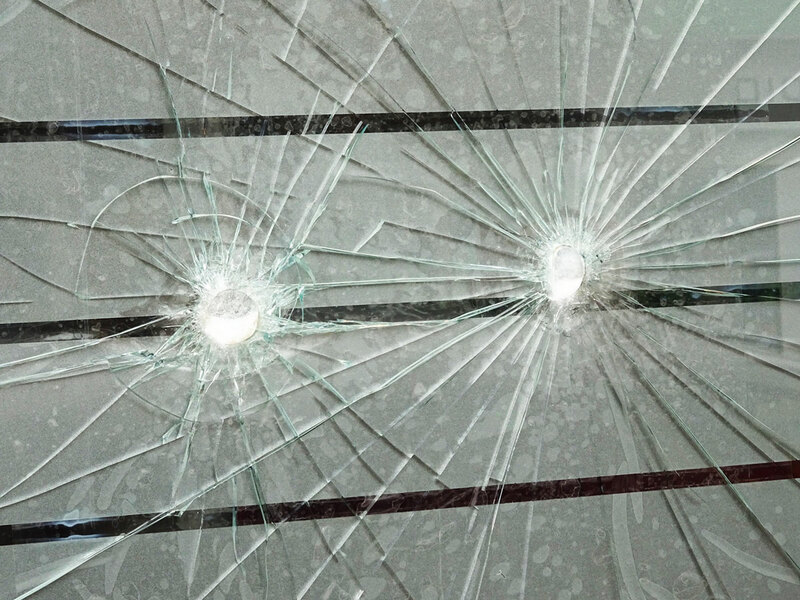 For most consumers, truly bulletproof glass isn’t a viable option. The products typically available are better described as bullet-resistant. If a window or door were to be truly bulletproof, it would be so thick that seeing through it would be virtually impossible. Typically, there are two types of bullet-resistant glass windows available to the general public: solid acrylic and and laminated. Solid acrylic windows can protect against projectiles and is available in varying thickness. Bullet-resistant glass can also be made using laminated materials, just like the hurricane-proof windows. However, with bullet-resistant glass, the layers tend to be much thicker to increase the level of protection. In short, both hurricane-resistant windows and bullet-resistant windows rely on laminated glass. Bullet-resistant products are similar to hurricane-resistant windows, but use a thicker version of laminated glass. Many hurricane impact windows are made from laminated glass with a polymer layer between the two glass sheets. When comparing the two, the thickness of the windows has to be considered as a major factor in their ability to stop a bullet. Usually, bullet-resistant glass windows are thicker than a typical impact window. This is due to the fact bullet-resistant glass doesn’t reflect bullets. Instead, the window absorbs energy resulting in bullets being unable to penetrate the glass, becoming embedded in it instead. So, can hurricane impact windows stop a bullet? The answer varies. There are reported cases where hurricane glass has stopped bullets before. However, it is important to note that not all impact windows can block a bullet due to glass thickness, materials used, and design elements differing between window types and brands. And remember, extra security from acts of violence is just one of the many benefits you’ll receive from installing impact windows. You’ll also keep your home safer during natural disasters, have less of a hassle to deal with than hurricane shutters, and dampen outside noise.